What a fabulous ending to a brilliant series. This whole series has really touched me and I was super nervous about reading this book. I was scared, for two reasons, firstly, Andy was getting old in book 2, I knew my heart couldn’t have taken it if he died, secondly I didn’t think that I could cope if he found love again, again, my heart I didn’t think could take it. This series though makes you think and reflect, it is thought provoking and inspiring, even though you have been put through the mill the love that this family has for each other just radiates from the page and you cannot help but get that warm, fuzzy feeling inside and aspire to being a family like Andy’s. Their bonds are strong, they are always there for each other, extremely supportive, loving and caring, just a beautiful family with an amazing story to tell. 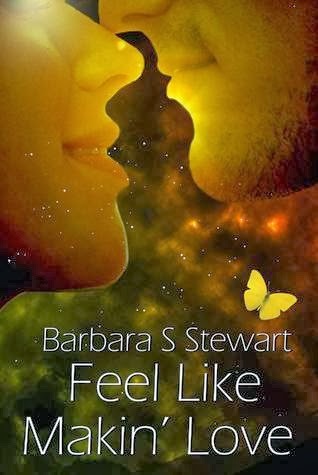 This though is testament to Barbara Stewart’s writing, because they all have become one of my family, it was like reading the life story of family friends, because they truly became a part of me. This story shows that through the good times and the bad, family will always be there for you, you are not alone, lean on them, let them carry some of the weight and the burden, lighten the load and deal with what has been thrown at you. When you love, you love completely and fiercely and that there is always someone in the world, worse off, grab what you have with both hands and make the most of it, but most of all, always be yourself. In this book Carlee has trials and tribulations of her own to deal with. Life does not always play fair as we all know and Carlee now has her own journey to make. We all know Carlee is a strong woman, she is an incredible character, selfless, loving, thoughtful and caring but she will need all her strength and willpower to overcome the troubles in Feel Like Makin Love. As always her dad Andy is there by her side together with Carlee’s husband. Although not her biological dad, the connection that these two have is intense. As they say “any man can be a father, but it takes a special man to be a dad” and that is exactly what Carlee and Andy have. Although not bound by blood, their bonds are stronger, they are made with love and this book proves that statement completely. Andy is also beginning a journey of his own. Now that Carlee is married and living in London, he is lonely. He feels that he cannot move on, he is betraying Bethy’s memory. Even though he knows that no-one will ever replace her, he needs guidance and a bit of a push to make a move. He needs a companion and it is Carlee that lets him know that it is OK, at the end of the day, Bethy would never have wanted him to be lonely. We see some links to the past severed in this book and although I thought I would be devastated, I was actually relieved. Andy and Carlee can finally move on and Barbara Stewart has now brought their story full circle and wrapped it up beautifully. This has been one amazing trilogy and one that will stay with me for a long time. It will definitely be a re-read series. I have only given this book 4.5 stars, because my max is 5 and Rock and Roll Never Forgets was such an amazing book that it has set the bar for this series. All 3 books are seriously good and not to be missed. Although I am going to miss this family something fierce I cannot wait to see what Barbara has in store for us next. Once again Barbara, amazing job.